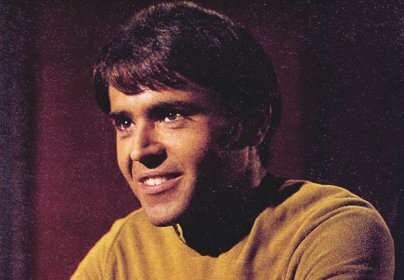 Walter Koenig's parents were both Russian, but he grew up in Manhattan. His family's name was originally Koenigsberg. In his childhood, the family was very poor, constantly late with the rent and evicted more than once. Later, when Joseph McCarthy was loudly railing against all things Russian, Koenig's father burned all of the family's Russian music albums, and instructed the children to say they were Lithuanian, not Russian. In college, Koenig earned a degree in psychology, but one class in drama had more of a lasting impact. An advisor suggested he should study further, so Koenig enrolled at New York's Neighborhood Playhouse, where his classmates included James Caan and Dabney Coleman. Koenig had a long résumé of off-Broadway and TV parts before Star Trek, including guest bits on Ben Casey, Combat, and I Spy. He was added to the cast of the original Star Trek in its second season. The character was "Ensign Jones" when Koenig auditioned, and was supposed to be British -- an attempt to appeal to "the bubble-gum audience" that was, at the time, wild for Ringo Starr and Davy Jones. The character became "Ensign Pavel Chekov" when series creator Gene Roddenberry heard that the Soviet propaganda sheet Pravda had criticized Star Trek as "typically capitalistic", showing a multicultural future that apparently included no Russians. In response, Roddenberry retooled the character as a Russian, almost comically proud of his homeland. Then again, the Pravda story may have been an invention of NBC's PR department. It wasn't available in English at the time, and no translation of an alleged review of Star Trek has even been found. "I was told that it was a recurring role and it would certainly depend on how the character was received as to how many appearances I would make. So it was a constant surprise for me, because I worked on one show and they said, thank you very much, and then I'd think that would be it, and then they’d call me back for a second show, etc." After Star Trek left him typecast, Koenig's career consisted mostly of small-scale theater work, hundreds of appearances at Star Trek conventions, seven Star Trek movies, and a recurring role as Alfred Bester, a delightfully sinister character on Babylon 5. He has written for several cheesy science-fiction shows, including Land of the Lost and the Star Trek cartoon series. Koenig also wrote an episode of the Kristy McNichol drama, Family, the novel Buck Alice and the Actor-Robot, and an autobiography, Warped Factors.